Drawing of Commodore Perry, Grossly distorted if not humorous rendition of Commodore Perry by a Japanese artist who apparently never knew what Perry really looked like. 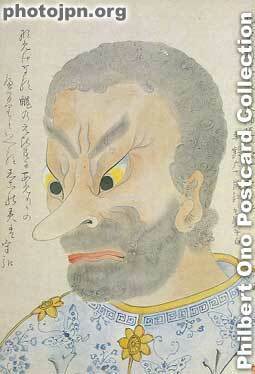 It was drawn at a time when the Japanese thought all foreigners were barbarians. He looks like a human being, not a ghost nor barbarian. how don't know, that americans are barbarians? !